The design of your FirePit is entirely up to you. 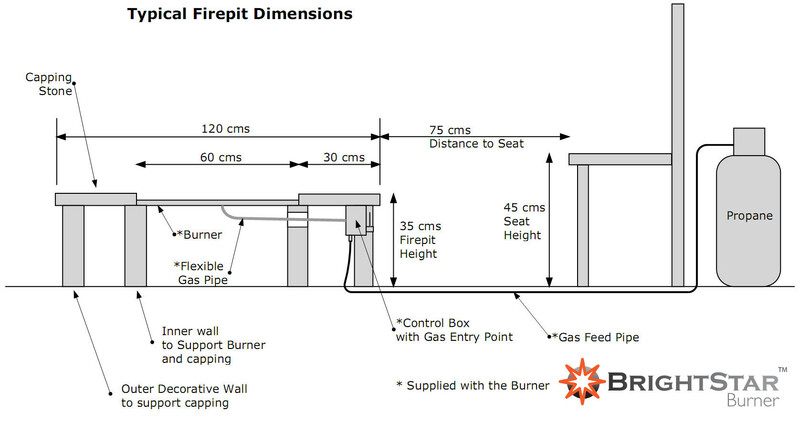 There are certain size restraints to ensure the burner can be installed but, apart from that, the overall look is left to your own imagination. You can build it using practically any brick or concrete non combustible products that match your existing garden design. 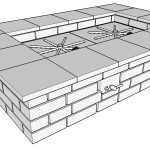 One very important feature of the FirePit design is that it must have some form of ventilation holes around the base of the pit at ground level. This can be achieved with normal air-bricks, or just a series of holes drilled through the brickwork. These ventilation holes allow water to escape otherwise your pit would fill up when it rains. This also allows air to enter underneath the burner, which is required to maintain the correct gas/ air combustion mixture. Finally, LPG gas is heavier than air, which means any unburnt gas will sink to the base of your pit and, without a means to escape, would build up to a dangerous level. (Natural gas is lighter than air so does not have this problem). You can even go double for bigger installations! Every FirePit is unique, so here are a few ideas. You could use existing standard paving slabs, or even house bricks or block paving bricks. One customer used a contemporary black granite (kitchen worktop) with white rendered sides, whilst another used random crazy paving with cobblestone sides for a more rustic look. We had one installed against the side of the house within it’s own fireplace and chimney above, whilst another was installed in the middle of a concrete table. We’ve even had people convert existing ‘wood burning’ FirePits by installing one of our burners. We had one round burner installed in a triangular pit and we have supplied bespoke burners for specific customer requirements, so the possibilities really are endless. We are always happy to discuss your ideas to see if they are feasible (and safe).